Stats shown are with passive auras/Blood of Dreeg active. Mortar Trap's damage is split between Physical, Fire and Lightning. We use the Blood Orb's conversion and some Physical to Chaos conversion from Consecrated Blade/Weapon Components to roll everything up into a nice ball of Chaos. We support our Mortars with the occasional nuke from Doom Bolt* and the sheer myriad of debuffs at our disposal while they are firing. Excels against enemies that are slow or stand around. This should be obvious but big slow enemies like the Skeletal Gargantuans or Obsidian Ch'thonians are perfect for this build. They stay in your mines longer, they make aiming for your Mortars easier, you can safely stay at a distance from them and fling Doom Bolts with impunity. If worst comes to worst, you can run away and let your Mortars finish them off or weaken them while you're recovering. 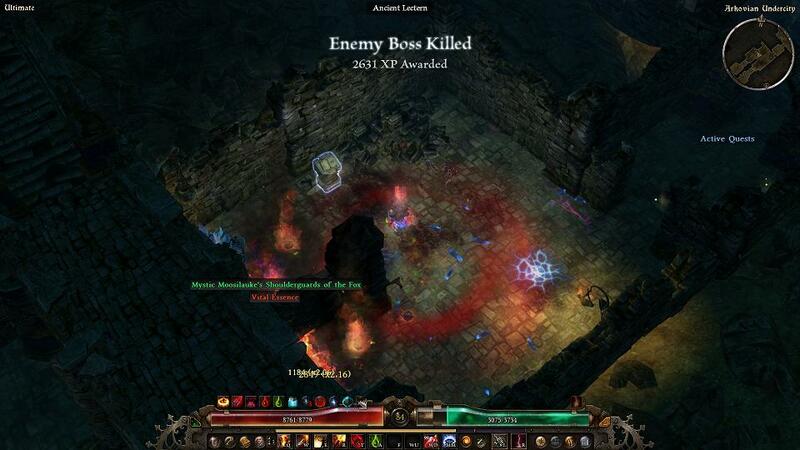 A similar case can be made for enemies that use ranged attacks as they will rarely move unless you move. Fire and forget damage. As i briefly mentioned just above, you can freely disengage and recover and your Mortars will continue to bombard your enemies. Hard time against enemies that are always in your face. For fast/hard hitting enemies, they're going to just run through your mines or cocktail fire in a second, you need to facetank them for your resist reduction to do something. Problem is, if you can't, you're going to have a long fight. Prime examples of enemies like this would be Shar'Zul or Sentinel. No circuit breaker. Circuit breakers for those who don't know are abilities that act as fallbacks and keep you from dying such as the Soldier skill, Menhir's Will or the granted skill from the medal, Mark of Divinity. If you spot your health start to drop, be cautious and manage your health well as in certain situations, you won't get a second chance. Low/No crowd control resistance. Things like slow, entrapment or freeze are going to be big problems. You at least have 100% skill disruption protection. Thermite Mine: Provides -33% chaos resistance. Blackwater Cocktail (Hungering Void): Provides 25 reduced all resistance and -18% physical damage taken. It also procs Hungering Void and due to the number of hits, is also amazing at proccing Moment of Clarity at the same time! Flashbang (Eldritch Fire): Provides a number of crowd control effects and -20% chaos resistance through Eldritch Fire. 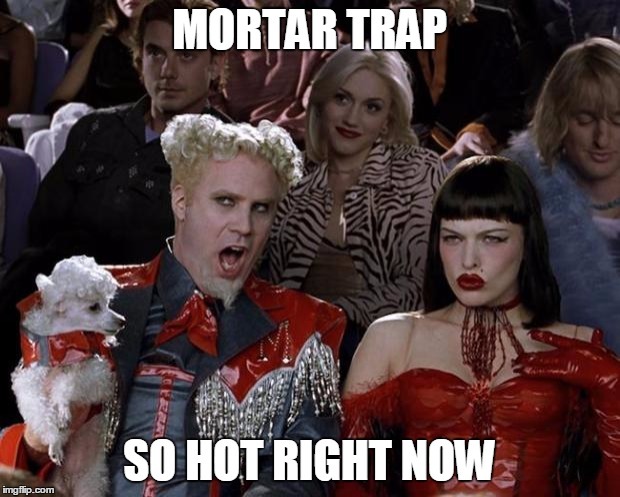 Mortar Trap: Our main AoE and contributor to single target damage. Doom Bolt: Booster to single target damage. Blood of Dreeg: Source of OA and health recovery. Pet Attack: Have it on hand to direct fire towards heroes/bosses. Clairvoyance: Not much to say, basically an infinite Elixir of Spirit. Optionally, you can use Solael's Flame for a bit more resist reduction but I've opted not to as i'm juggling enough keys as is. Vindictive Flame: Source of movement speed and health recovery. Solael's Witchfire: Mostly for the transmuter. 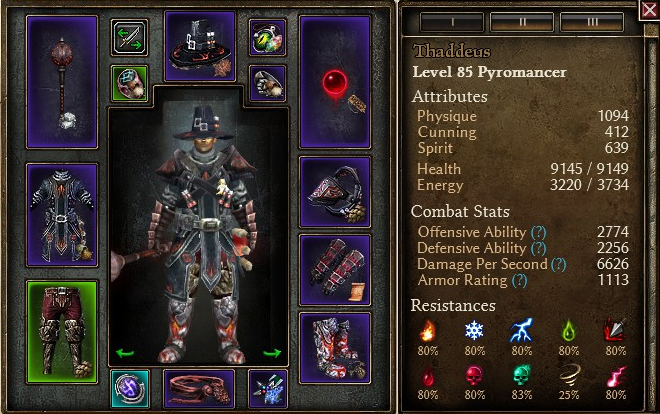 The resistances and % damages are nice. Possession: Damage reduction, more damage, no skill disruption is nice. The main piece of gear required/recommended for this build is the Blood Orb of Ch'thon, though the Clairvoyant set is also highly recommended as it provides a massive amount of extra skill points through it's +2 to all skills. The 4-piece also grants a 10% chance of 100% skill reduction meaning you'll potentially be able to set up Mortars faster, throw out more Doom Bolts or keep yourself alive with your defensive abilties. Getting a Badge of Mastery with +5 to Mortar Trap will also allow you to drop 3 mortars instead of 2 as well increasing the build's performance. For MI affixes or stats, this build is weak on Aether and Acid resistance with Pierce and a bit of Bleed following just behind. I'de also suggest looking for either Offensive Ability or Defensive Ability in big chunks and adjusting your devotion accordingly (more on that later). Finally, i would look out for stun resistance once you have capped your resistances and have your OA/DA in a good place. The constellations I took can be found in the above grimtools link but that's not what i'm going to talk about here. What I am going to discuss is the placement of the last 7 points. The important constellations here are: Raven and the first 3 points of Ulzuin's Torch. This will get your a fair bit more Offensive Ability and some crit damage % and movement speed as a bonus. The important constellations here are: the crossroads order node, Lion and the lower 3 points of the Obelisk of Menhir. This gets you a fair bit of health, armour and some needed DA. This is the path I use as my ring and pants combined give me roughly 200 flat OA, therefore I need the DA to balance them out. Enough points in spirit to equip the required gear. Rest in Physique. To help compensate for Spirit, i recommend using Rhowan's Wisdom instead of Survivor's Ingenuity while levelling in the later levels and swapping them out when you have enough spirit. For the record, the final grimtools link above shows 4 points in spirit as being enough. Drop your Mortars down and keep them active, they last for 18 seconds so they'll stick around for some time. Throw out Doom Bolts on small clusters of enemies or heroes/bosses and in between casts, keep up your debuffs. Even if it means spamming Flashbangs . 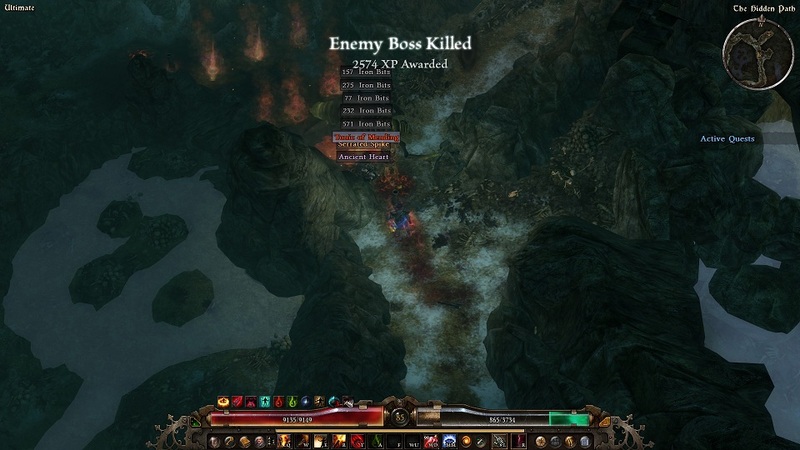 Try to keep groups or bosses inside of your mines/cocktail fire by circling around them or kiting them through the area if possible. I'm going to add this here as someone will no doubt want to know how to level this build. The simple answer is, i don't know how and don't particularly recommend it without making some modifications. Without the Blood Orb, Mortar Trap and Doom Bolt's damage types do not mesh together. They are also both located at the end of their respective masteries trees so will take a long time to reach them and you will want to spend points in other skills as you move towards them. Because of this, i recommend levelling up as another build or something similar to this build and swapping to the full thing when you have the gear ready and are at the right level. Personally, i levelled through all of Normal, Elite and Act 1 of Ultimate as a 2H Fire Striker with Mortar Trap/Flashbang/Thermite Mine, used Sacred Strike instead of Blackwater Cocktail to save on points and in devotions, replaced Oklaine's Lantern with Kraken. Mainly because I hadn't played a Fire Striker in a long time . You could replicate the build but Fire/Lightning instead of Chaos by using Grenado instead of Doom Bolt for your nuke and swap out later but I have not tried it. Last edited by Evil_Baka; 06-28-2017 at 06:59 PM. Reason: Added sections, fixed spelling mistakes. Updated character window with final gear. Ran a quick test while levelling/grinding Undead rep to see if this build in it's current state could at least take on a big lumbering oaf and it can without issues/with some antifreeze. Next test will probably be Rashalga. 2 deaths before i figure out how to pace myself and deal with the big bug again. Rashalga is no problem either. Last edited by Evil_Baka; 05-08-2017 at 07:53 PM. I tried a similar build using Chaos Grenados but I wasn't happy with it's damage output. The highest I could manage were 60-70K Grenado's which technically was Ok but I could achieve much greater results just staying elemental. Last edited by Chthon; 04-25-2017 at 04:33 AM. Pretty sure Blood Orb preventing Con is intentional. It's health cost, which is another way to say damage, and it's kind of thematic. Build looks nice. I'd have to find a way to do without the Clairvoyant set though, the conversion to Aether would annoy the hell out of me. Well thematic or not it is preventing me from having access to a game feature. I think that's generally the point. The conversion is a strong option, so it needs equal balancing. The easy option would be a damage penalty, but that'd render the item nearly unusable if the penalty was strong enough. Instead, it costs you health regen, and forces you to deactivate it between fights if you want your constitution to work. You're getting 100% conversion of three damage types to one different damage type. That's not insignificant, after all. Last edited by Chthon; 04-25-2017 at 07:58 AM. I'd have to find a way to do without the Clairvoyant set though, the conversion to Aether would annoy the hell out of me. It bothers me too a bit, i even tried suggesting a way around it for Clairvoyant builds that want to focus on Chaos instead of Aether without creating any disruptions in how the set works and interacts with other items like Albrecht's Duality. Well, i'm still debuffing Aether a bit through Agonizing Flames so I guess it's not a complete waste, could be useful to have a chunk of Aether for any massively Chaos resistant enemies. Originally, I was planning on using BWC with the Infernal Knight set instead of Doom Bolt . Then I realised i'de have energy problems and swapped to Sorcerer, then one late night while i was tired, i stumbled upon the Clairvoyant set and it seemed to fit too well to ignore . Yeah, i really like the skill as well. Especially when you get multiple Mortars going.